Cyprus (Greek Κύπρος, Turkish Kıbrıs, ) is an island in the Mediterranean Sea, south of Turkey. After Sicily and Sardinia, Cyprus is the third largest island in the Mediterranean Sea. Although the island is geographically in Asia it is politically a European country and is a member of the European Union. 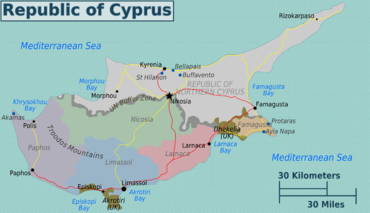 As the two regions are nearly completely separate from a traveller's point of view, this article will concentrate on the southern territory governed by the Republic of Cyprus. This is not a political endorsement of claims by either side in the dispute. For travel information regarding the remainder of the island, read our Northern Cyprus article. Cyprus gained its independence from the United Kingdom in 1960. Despite a constitution which guaranteed a degree of power-sharing between the Greek Cypriot majority and the Turkish Cypriot minority, the two populations – with backing from the governments of Greece and Turkey, respectively, clashed in 1974, with the end result being the occupation of the northern and eastern 40% of the island by Turkey. In 1983, the Turkish-held area declared itself the "Turkish Republic of Northern Cyprus". So far, only Turkey recognizes the TRNC, while all other governments and the United Nations recognize only the government of the Republic of Cyprus over the whole island. The UN operates a peacekeeping force and a narrow buffer zone between the two Cypriot ethnic groups. Fortunately, open hostilities have been absent for some time, as the two sides (now with the growing involvement of the European Union) gradually inch towards a reunification of some sort. Temperate; Mediterranean with hot, humid summers and cool, wet winters. Central plain with mountains to north and south; scattered but significant plains along southern coast. Cyprus International Press Service sells maps of the whole island of Cyprus and regional maps. The United Kingdom retains two small Overseas Territories on the area of the Republic of Cyprus, called Akrotiri and Dhekelia, comprised of a few parts of villages and two military bases. Cypriot cities have a variety of historical spellings and writings, all in fairly common use, and which change according to the context, whether it be Greek Cypriot, Turkish or English tourist. The following list emphasizes traditional English spellings, that will most often be encountered by the traveller. Troodos Mountains - the mountainous region of Troodos offers visitors a range of activities and agrotourism destinations along with over 9 UNESCO World Heritage Sites. Prominent villages in the region include Kakopetria, Platres, Palaichori, Chandria, Spilia among others. Lefkara The Lace village,in the foothills of the Troodos Mountains, a charming little town with lots of character, in the heart of Cyprus. Protaras - a predominantly tourist resort. It comes under the administrative jurisdiction of Paralimni Municipality. It has clear sky-blue waters and and sandy beaches, the most well-known of which is Fig Tree Bay. Pitsilia This agricultural region is an area with charming picturesque villages where you can experience the authentic rural life of Cyprus. Agros, Kyperounda, Pelendri, Potamitissa are a few of the villages you can visit within a day. Beautiful nature, traditional architecture, byzantine churches, wineries, Commandaria museum are worthy visit. Most of it ask to watch or follow the local people in their agricultural activities. EU, EEA and Swiss citizens need only produce a national ID card or passport which is valid for the entirety of their stay in Cyprus. All other nationals who are required to have a visa ( except nationalities such as New Zealanders and Australians), however, must produce a passport which has at least 3 months' validity beyond their period of stay in Cyprus. Children registered on their parents’ passport can travel to Cyprus until the age of 16. For more information, visit this webpage of the Ministry of Foreign Affairs of Cyprus. Cyprus is a member of the Schengen Agreement but has not yet fully implemented it. For EU and EFTA (Iceland, Liechtenstein, Norway) citizens, together with those of Switzerland, an officially approved ID card (or a passport) is sufficient for entry. In no case will they need a visa for a stay of any length. Others will generally need a passport for entry. Travel to/from any other country (Schengen or not) from/to Cyprus will (as of now) result in the normal immigration checks, but travelling to/from another EU country you will not have to pass customs. However, if Cyprus normally requires a visa for your nationality, this may be waived if you already have a valid Schengen visa. Inquire at your travel agent or call the local consulate or embassy of Cyprus. Cyprus' main airport is Larnaca International Airport (LCA) and is on the outskirts of Larnaka. The previous main international airport located SW of Nicosia is now located on the Green Line separating the Greek and Turkish parts of Cyprus - it has been out of use since 1974. Cyprus is serviced by a variety of different carriers. There are flight connections with most major European cities, e.g. Athens, London, Birmingham, Manchester, Frankfurt, Paris, Amsterdam, Rome, Milan) and many Eastern European countries. There are also connections to almost all Middle Eastern capitals. There are no flights to Turkey from the south. There is a frequent and cheap (€1.50) public bus connection from the airport into central Larnaca, but it is poorly indicated. The bus stop is at the departure hall level (upstairs) on the left side at the first lane. It shows a sign with a series of three digit bus numbers. Most buses stops at "Finikoudes", at the beach in Larnaca where buses to other destinations in Cyprus leave (see "getting around" section). There is also a direct Larnaca Airport - Nicosia, Nicosia - Larnaca Airport Bus service provided by Kapnos Airport Shuttle. The journey takes around 30-45min (depending on the traffic and the hour), and a one way ticket costs €8 per person. There are bus routes throughout the night. There is also in airport in the southwest of the island, near the city of Paphos. Its main carrier is RyanAir and it thus serves low-priced flights to destinations in Europe. There are also lots of cheap flights into Ercan International Airport, which lies in the northern part of the island, all going via Turkey. Occasional ferries connect Cyprus to Greece. Services to Israel and Egypt have been terminated for the time being; however, there are 2 and 3 day cruises running in the summer months from about April to October and they take passengers one way between Israel and Cyprus. These mini cruises also run to Syria, Lebanon, Rhodes, the Greek Islands, The Black Sea and The Adriatic. The ferry service from Greece runs from Piraeus, Rhodes and Ayios Nikolaos in Crete to Limassol. See the itinerary here: You may also catch a freighter from Italy, Portugal, Southampton and various other European ports. See Grimaldi Freighter Cruises providing you with the opportunity to bring a vehicle to Cyprus throughout the year. There is a regular ferry service from Turkey, connecting Taşucu to Girne (north of Nicosia) . Prior to Cyprus's accession to European Union, evidence of entry to Northern Cyprus resulted in denial of entry to the Greek part of Cyprus at the very least. After the accession, and according to EU legislation that considers Cyprus to have been admitted in full, an entry to the Turkish part is formally an entry to whole Cyprus and must therefore not result in any disadvantage to travellers from the EU. Travellers from non-EU member states (as, for instance, Turkish citizens) must enter the island via one of the legal entry points (ie entry points in the Southern part of the island) in order to visit the Southern part. The Cyprus embassy in Washington on the phone (June 2006) when asked if the border is open to US citizens, didn't give a 'No', but said that they recommend entering from the legal points in the Greek side. Different entities and web pages claim different things. But there are recent (2012) examples of people entering Northern Cyprus from Turkey, crossing the border without any problems, although it was noticed when leaving Cyprus. Ledras Str. (foot only) - the new pedestrian crossing opened in 2008. Located at the old "dead-end" of the most popular street of Nicosia. For EU citizens, an ID card is sufficient to visit the North and allows you to enter and leave as often as you like. This makes Nicosia well worth visiting, as the best shops and restaurants are in the southern part of Nicosia but the most historic sights are in north Nicosia. The contrast between the two halves of the city is an experience in itself. GoogleMap services traces roads and motorways from Limassol to Paphos through UK Episkopi military base. In practice UK-owned territories are situated outside mentioned roads which are regulated by Cyprus authorities. No document in addition to Cyprus entry required and no check-in performed. Approximate boundaries of UK-controlled territories could be accessed with OpenStreetMap. Public transport in Cyprus has been revamped with all new buses in Nicosia. Still, most Cypriots drive. There are no railways in Cyprus. There is a comprehensive network of bus routes all over Cyprus. Use Cyprus By Bus to plan your journey using buses in Cyprus. On the Turkish side, buses are more frequent (and smaller). In Nicosia, they depart from stops at the street north of the northern gate. Prices are similar to prices on the Greek side of Cyprus. Beware that return tickets may not be valid on all buses on the Turkish side. Services run every half-hour or so from 06:00 or 07:00 in the morning, but terminate at 17:00 or 18:00 on the dot. You can book a taxi to pick you up anywhere and ask to be dropped off anywhere in city limits; the flip side is that it will often take you longer to get in or out of the city than the journey itself! Figure on GBP4-6 for a taxi ride on any of these, with an increased price on Sundays and holidays. Also known as a service taxi. Car hire is the easiest (but the most expensive) way to get around the island. Cypriots drive on the left side of the road, in keeping with most Commonwealth practice. However, driving standards are poor. Drivers attack their art with an equal mix of aggressiveness and incompetence and view road rules as mere guidelines. Some main roads do not even have road markings and people often sound their horn, especially in Nicosia. Take care when crossing the roads, and even greater care when driving on them. Bicycle road network is well-established and quite popular between major coastal cities. Bicycling on motorways marked with 'A' letter is prosecuted. Pitsilia area on Troodos mountains, where agricultural life and some of the finest wineries can be experienced while staying in small agrohotels in Agros, Kyperounda, Pelendri, Potamitissa and more. There you can visit few of the best wineries of Cyprus, such as Kyperounda Winery, Tsiakkas Winery at Pelendri. Commandaria area is the region where the legendary Commandaria sweet dessert wine is produced. A visit to Commandaria Museum is worthy the time. Don't forget to stop in a local agrohotel, or visit the local kafeneion to chat with local people. Hamam Omerye in Nicosia, Cyprus is a 14th century building restored to operate once again as a hammam for all to enjoy, relax and rejuvenate. Dating back to French rule and located in the heart of Nicosia's old town, the site's history dates back to the 14th century, when it stood as an Augustinian church of St. Mary. Stone-built, with small domes, it is chronologically placed at around the time of Frankish and Venetian rule, approximately the same time that the city acquired its Venetian Walls. In 1571, Mustapha Pasha converted the church into a mosque, believing that this particular spot is where the prophet Omer rested during his visit to Lefkosia. Most of the original building was destroyed by Ottoman artillery, although the door of the main entrance still belongs to the 14th century Lusignan building, whilst remains of a later Renaissance phase can be seen at the north-eastern side of the monument. In 2003, the EU funded a bi-communal UNDP/UNOPS project, "Partnership for the Future", in collaboration with Nicosia Municipality and Nicosia Master Plan, to restore the Hamam Omerye Bath, revitalising its spirit and sustaining its historical essence. The hamam is still in use today and after its recent restoration project, has become a favourite place for relaxation in Lefkosia. In 2006 it received the Europa Nostra prize for the Conservation of Architectural Heritage. The official languages of Cyprus are Greek and Turkish. Greek is spoken predominately in the south and Turkish is spoken predominantly in the north. English is very widely spoken both in south and north by locals of all ages - partially because of previous British rule and partially due to the tourism industry. Other common languages spoken on the island are Russian, French and German. Cyprus has the euro (€) as its sole currency along with 24 other countries that use this common European money. These 24 countries are: Austria, Belgium, Cyprus, Estonia, Finland, France, Germany, Greece, Ireland, Italy, Latvia, Lithuania, Luxembourg, Malta, the Netherlands, Portugal, Slovakia, Slovenia and Spain (official euro members which are all European Union member states) as well as Andorra, Kosovo, Monaco, Montenegro, San Marino and the Vatican which use it without having a say in eurozone affairs and without being European Union members. Together, these countries have a population of more than 330 million. In Northern Cyprus, the "official" currency is the Turkish lira. Euros are widely accepted in Northern tourist centres, but typically at a 2,5/1 ratio while official course is 2,75/1 (Apr 2015). There are many ATMs in the North too. Cash exchange in South Cyprus bank is subject of 3,5% commission. Lacework of an intricate nature - from the village of Lefkara. Best time for shopping is from 10am to 4pm otherwise shops could easily be found closed. Generally cheapest prices could be found in big cities. Kiosks usually don't sell bread and vegetables. Pharmacies in Cyprus are open from 8am to 6:30pm with lunch break from 1:30pm to 3pm on Monday, Tuesday, Thursday and Friday. On Wednesday and Saturday pharmacies are closed after lunch break. Overnight pharmacies are obliged to be open until 10pm and be reachable by phone until 8am of the next morning, although in fact owners usually keep pharmacies open all the night. Overnight pharmacies change daily, you can always find pharmacies that are currently on duty on http://cyprus-pharmacies.com/. Cypriot meze (appetizers akin to Spanish tapas) are an art form, and some restaurants serve nothing but. Meze are available in a meat variety or fish variety but quite often come as a mixed batch, which is rather pleasing. Halloumi (Hellim) is a uniquely Cypriot cheese, made from a mix of cow's and sheep's milk. Hard and salty when raw, it mellows and softens when cooked and is hence often served grilled. Taramosalata is traditionally made out of taramas, the salted roe of the cod or carp. The roe is either mixed with bread crumbs or mashed potatoes. Parsley, onion, lemon juice, olive oil and vinegar are added and it is seasoned with salt and pepper. Dolma , Turkish stuffed bell peppers. There are countless hotels and hotel apartments of varying degrees of luxury within Cyprus. Alternative self-catering accommodation is offered in restored traditional houses in picturesque villages all over Cyprus through the government Agrotourism initiative. Popular agrotourism holiday destinations can be found in the Troodos Mountains. Cyprus' climate and natural advantages mean that there is always a steady supply of travellers seeking employment and residency on the island. Perhaps the biggest change that has occurred in recent years has been the accession of Cyprus to the European Union on 1 May 2004, opening up new employment opportunities for European citizens. The burgeoning Cypriot tourism industry, however, means that there is a huge seasonal demand for temporary workers of most nationalities during the summer months, with a definite preference for English-speaking workers in order to service the very large numbers of British tourists. The Greek Cypriot South remains the best overall bet for jobs, as the South is where the majority of the tourist trade is located. The Turkish North is much harder to get work in as a traveller, as the local economy is in a precarious position and high local unemployment means competition for work is fierce. Seasonal employment will most probably involve working in one of the countless bars, hotels and resort complexes of the South. Such work is usually poorly paid, but accommodation is often thrown in as some compensation and the Cypriot lifestyle usually makes up for low wages. Many holiday companies employ 'reps' (representatives) and marketing staff to assist their operations on the island - this work is usually more financially rewarding. Teaching English as a Foreign Language (EFL) is another worthwhile option, well paid though often difficult to find. Finally, Cyprus' ongoing construction boom in tourism infrastructure results in a demand for skilled builders and tradesmen. Tekni Art , also run a one year visual arts programme between September and July. In order to find long-term accommodation, you may also do well to contact one of the licensed real estate agents on the island, such as City Living Real Estate . Steer clear of unlicensed agents in Cyprus, as these dangerous companies cannot offer any legal protection for rental tenants or prospective property purchasers in the event of trouble. Beware that Greek Cyprus celebrates Easter on different dates than Western Europe, in most years. In contrast to Western Europe, in the Orthodox church Easter is considered more important than Christmas. On Easter Sunday, many musea etc. are closed, and buses run reduced services in some places even until Easter Tuesday. Cyprus operates on a 230V, 50Hz electrical system using the BS-1363 3-pin British plugs. Europlug adapters are widely available in local stores. Portable gas tank for EN521/EN417 stoves could be purchased in every supermarket or minimarket for €1-2,5 depending on their size. Extreme sports and camping shops do not sell them. Cyprus is a remarkably safe country, with very little violent crime. However, it is wise to be careful when accepting drinks from strangers, especially in Paphos, since there have been numerous occasions of muggings. Note also that the numerous Cypriot "cabarets" are not what their name implies but rather brothels associated with organized crime. It is best to avoid discussion of the various merits of the Greek-Turkish divide and events beginning in 1963 in some quarters. Any disrespect of Archbishop Makarios will be looked down upon. Internet access is increasingly available in tourist centres in the guise of internet cafes and side rooms equipped with monitors. Prices vary, so shop about. €1.5 an hour seems average, but you can do better. Many cafes now offer free Wi-Fi access. Most hotels and resorts now offer internet access to their guests under various arrangements. This page was last edited on 5 April 2019, at 16:10.